The desire to ennoble the country site, convertit into an attractive cozy place for a comfortable stay, it is quite natural. 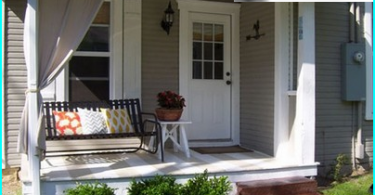 Favorite flower many gardeners are always popular element of landscape design suburban areas. Worthy rim in such compositions often act beds of tires, which are some of the easiest to create and practical to use products. Of course, you can buy ready-made pots in specialized stores. But by his own flowerbeds of the tires - it is not only beautiful and functional design element, giving the registration area of ​​exclusivity and uniqueness, it is especially proud of every summer resident. Well, when you can have a choice. Choosing between the old tires domestic producers and imported products, preference should be attributed to the side of the latter. 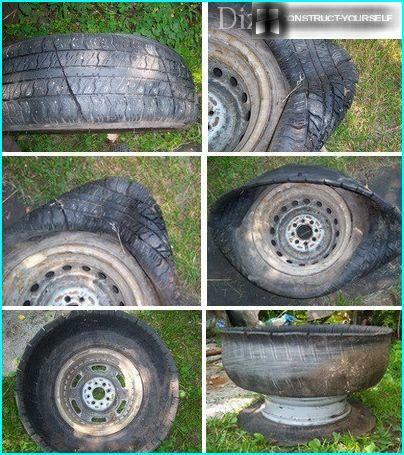 Imported used tires are softer and thin rubber, which is much easier to work with. If the choice between the "summer" and "winter" tires, the work is more like a winter version. 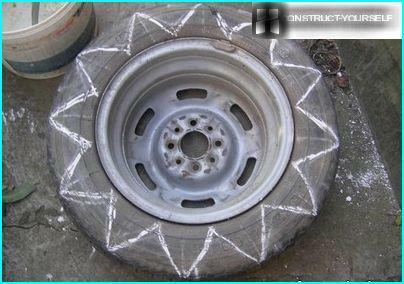 In order to make a bed of an oldtires, it is desirable to select a maximum wheel tread wear. Erased layer protector makes the product softer and significantly facilitate the eversion process it inside out. Contaminated soil and sand need to clean the tires. And it's not even that with a pure product more pleasant to work. Just when dealing with dirty tires and blade sawing blunts much faster. 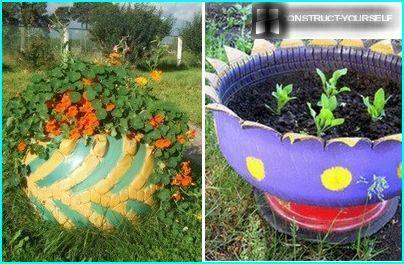 Before taken for making bedsof tires, you need to think about how it will look like the finished product: a bowl with smooth edges, vase with a wavy cut or a flower bed in the form of a big flower, fringed petals or fringe. Thinking the form of a cut, it is necessaryguided by the fact that the result should get a design on a "pan - cover": a deep and cut off the lower part of the upper part. Across the loop circumference is easily applied with chalk or felt-tipped pen. 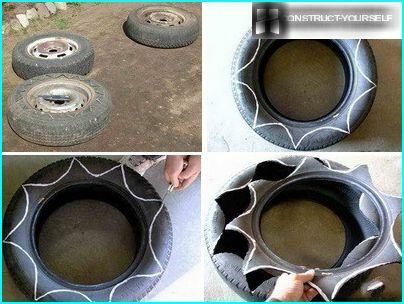 Thinking through how to make a bed out of the old wheels,issued in the form of a big flower, it is necessary for the edge of the product to cut petals. The size of each petal should not exceed 10-12 cm. Otherwise when reversing the tire rubber in these places just do not bend, and the bed will not accept a flat round shape. To facilitate the cutting process can be by applying liquid soap to lubricate the knife blade. Well, if the hand is fretsaw Saw. With the help of a jigsaw easily and quickly perform figure cutting. After completing incision along the contour of the tire, along the grooves of the tread needs to be done at a distance of 5-10 cm longitudinal slot. When you create a flower bed on the leg of his wheelshands, the first thing you need to unscrew the rubber tire inside out. For many craftsmen this stage of the work becomes a real stumbling block. 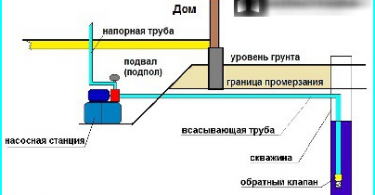 rubber eversion process itself is quite time-consuming process. In order to cut the steel cord is necessary tousing a grinder to perform several cuts on the outer side. Rubber cut smoothly. On contact with the drive cord can be seen in the image on the surface of the product on the fly and to allocate white smoke. The slots run at equidistant distance of 15-20 cm. After preparatory work can beginto tire eversion. 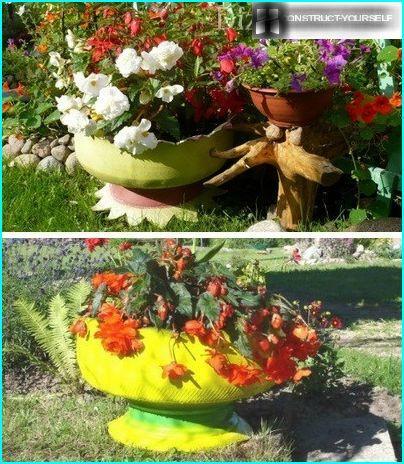 Before you start to turn out a covering for the flower beds, we would like to tell you a secret: it is enough to turn inside out at least a small piece of the tire, and work will be "like clockwork." 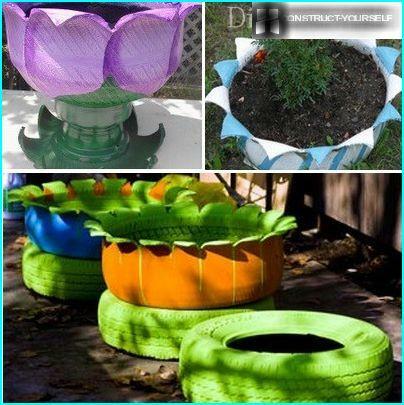 A flower bed of old wheels is ready, you can start decorating it. Create and cultivate flower beds in black uniformsnot very aesthetically pleasing. Therefore, as soon as a bed into the desired shape, you can start decorating it. 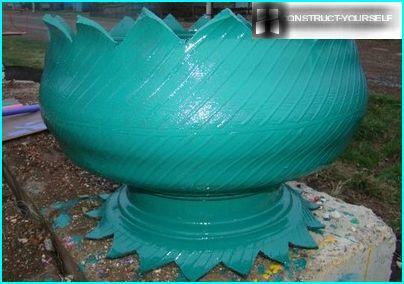 While the outer surface of the inverted flowerpot is not covered with dust, it is desirable to paint. For painting rubber products are perfectoil, enamel and nitropaint. On a clean surface of rubber paint falls even layer, and holds quite a long time. For coloring beds can also use the remains of car paint. With aerosol work can be done in just a few minutes. Using the design bright color tones beds will prevent an overheating of the earth inside the container. Most craftsmen stained rubber flowerbedOnly the outside. Nevertheless, to give the container a more attractive appearance, it is desirable to capture and slightly upper portion of the inner surface of the article. 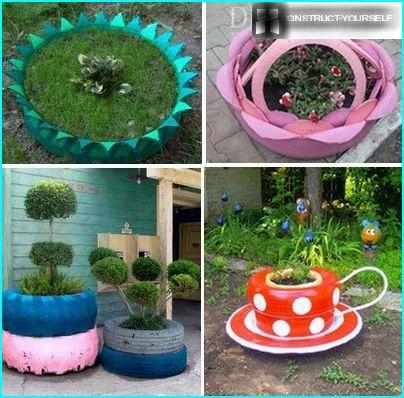 In the design of flower beds can be given full freedom of imagination. Glass aquarium pebbles glued on petals of the flower beds, create an illusion of dew drops. Wishing to further decorate flower bed, on top ofmonochromatic paint layer can be applied to a different color pattern. 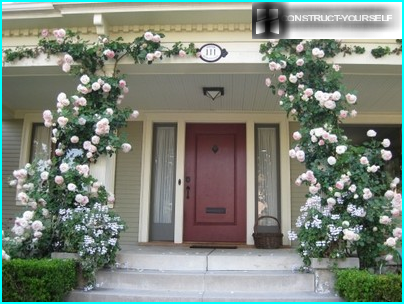 But particularly zealous not worth it: the luxuriant growth of flowers pattern flower beds can be completely closed hanging or creeping plants. This bed will be a good complement to the interior and landscape design element garden. It only remains to fill the capacity of the layer of soil and planted favorite flowers.